A formerly underused and largely forgotten pocket park in Seattle’s Capitol Hill neighborhood finds itself in the epicenter of the green building movement. McGilvra Place Park, located between Madison Street, 15th Avenue and East Pike Street, is the first project to attempt the Living Building Challenge for its landscape and infrastructure typology. The park is designed to push the leading edge of sustainability in urban parks. The decision to meet the Living Building Challenge came about largely because of the park’s proximity to the Bullitt Center, a building developed by the Bullitt Foundation that aims to be the greenest commercial building in the world. In conjunction with the development of the Bullitt Center, a neighborhood group formed to submit an application to the Seattle Parks and Green Spaces Levy Opportunity Fund to redevelop the park. Due in large part to the innovative sustainability objectives of the project, it was awarded funding in late 2010. McGilvra Place Park on Capitol Hill has a raised planting area and 11 century-old sycamore trees. 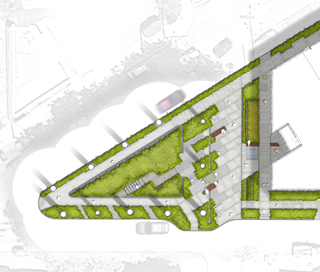 A pedestrian plaza will replace a block of 15th Avenue, bridging the park and the Bullitt Center. As Seattle became a bustling city of trade and industry at the end of the 19th century, John J. McGilvra, one of the first lawyers in Seattle, established a wagon road to reach his lakefront property on Lake Washington. The wagon road made way for a cable car and is now Madison Street, still the only street that directly connects downtown to Lake Washington. In doing so, the road intersected the city grid and created numerous triangular pieces of land that were not large enough to become development parcels but could become green space. McGilvra Place Park is one of these green spaces. The park consists of a raised planting area and 11 century-old sycamore trees on land owned by the Seattle Department of Transportation and primarily maintained by Seattle Parks and Recreation. Early on it was clear the priority of the park project should be to protect the trees, which have thrived for a hundred years on the site and are expected to live for another hundred years. The trees provide important ecosystem services and serve to showcase our natural environment. The McGilvra trees sequester an estimated 3,200 pounds of carbon each year, approximately half the annual amount of carbon generated by the average driver using a 25-mile-per-gallon vehicle. The trees also intercept approximately 44,000 gallons of water each year, the equivalent of half the average yearly water use for a family of four, or almost enough to fill the cistern in the basement of the Bullitt Center. The Bullitt Center can be described as functioning in many of the same ways as a tree, with its photovoltaic canopy, hardworking building core and self-sufficient base managing all of the water and nutrients that move in and out. The juxtaposition of this building to a park that is home to 11 robust and exemplary trees is a powerful image that inspired many of the decisions for the park. To protect the trees the design needed to be surgical in the modifications made to both the hardscape and softscape surfaces. The trees’ roots extend below the raised planting area, sidewalks and 15th Avenue roadway, where the project called for removing the existing road to create a pedestrian plaza. Disturbing the roots would jeopardize the health of the trees and their ability to provide ecological benefit. As a solution the project used the site’s existing subgrade to locate the new park elements. For example, by closing 15th Avenue to vehicles and removing the eastern curb, the park’s deepest new feature, a surface water runnel, could be placed in the depression formerly occupied by the base of the curb without requiring further excavation. A new walkway slices through the raised lawn area and thin metal walls will retain the soil and form the stairs, displacing a minimal amount of soil and disturbing as little of the roots as possible. All changes made to the site are purposeful, each element contributing to the surrounding environment, whether to slow the progression of water through the site or enhance the ecology and habitat for pollinators and small mammals. The benefits also extend to park visitors who, like McGilvra on the way to his lake retreat, may stop here for respite from the busy city streets. Bike racks, benches made from salvaged local trees and a pingpong table will activate the space and ensure there are more reasons to linger. As construction began in early February, it illuminated the importance of reconsidering the most basic construction activities. Routine decisions that seem small in isolation can undermine the intention of green building when looked at as industry-wide practice. Many of the lessons learned from this living landscape aren’t from big ideas or design concepts, but rather from small decisions. The Living Building Challenge requires products to be made without toxic chemicals and from local sources. The “red list” determines which materials are prohibited on Living Building projects. With a modest construction project like this one, it is easy to dismiss the decision to change habits when considering using only a small quantity of a material. This project illustrated how many of the cheapest and simplest products used daily, from common posts that support tree protection fencing to aggregates in concrete mixes, are manufactured and shipped from halfway around the world. It would be easy to rationalize that when you only need a small amount of something it doesn’t warrant the effort to source it locally or consider a material that doesn’t have as much embodied energy. The project also serves as a reminder of the value of reuse. Many basic construction materials are on the red list if purchased new. However, in an effort to encourage reuse of salvaged materials the Living Building Challenge allows a contractor to use materials already on hand or available from a previous project. The park contractor, who would normally buy new tree protection fence posts for each job, was able to use posts from a previous job. Concrete formwork will be salvaged from other job sites as well as some of the erosion-control materials. An effort was made to limit disposal of existing materials from the site. As part of this effort, the existing concrete sidewalk was saw-cut into large-scale pavers and reset as new pathways in the park. Additionally, the project highlights simple alternatives that are available once we take a minute to consider them. Many common finished materials can be eliminated through creative design. Raw steel was chosen to avoid processes like galvanizing, which bring high levels of zinc into the environment. Searching for alternatives can be challenging when schedules are tight and budgets even tighter, but exercises like this remind us how routinely we accept what is in easy reach. All of these strategies come together to create an outdoor gathering space to breathe new life into the park and showcase the objectives of the Living Building Challenge in the landscape. To learn more about this project see bit.ly/wikDG9 or www.bullittcenter.org. Rachael Meyer, landscape architect with Berger Partnership, is project manager for McGilvra Place Park and the Bullitt Center.